I have been loving Pineapple & Pineapple Juice lately. Well ever wondered what the Benefits of Pineapple is? I prefer it in my Morning Smoothie or event just sliced up in some salad on on yogurt. This Sweet & exotic juicy fruit is packed with some of the most important antioxidants in nature. Pineapple reduces swelling, high in vitamin C, manganese and fiber. 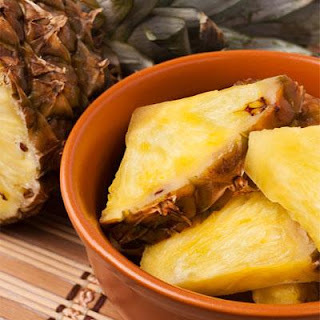 Potential Anti-Inflammatory and Digestive Benefits, Bromelain extracts can be obtained from both the fruit core and stems of pineapple. Also Antioxidant Protection and Immune Support you get from the Manganese and Thiamin (Vitamin B1) great for Energy Production and Antioxidant Defenses! Protection against Macular Degeneration, just three servings of fruit is your daily need.